A woman's Vespa skidded out of control. 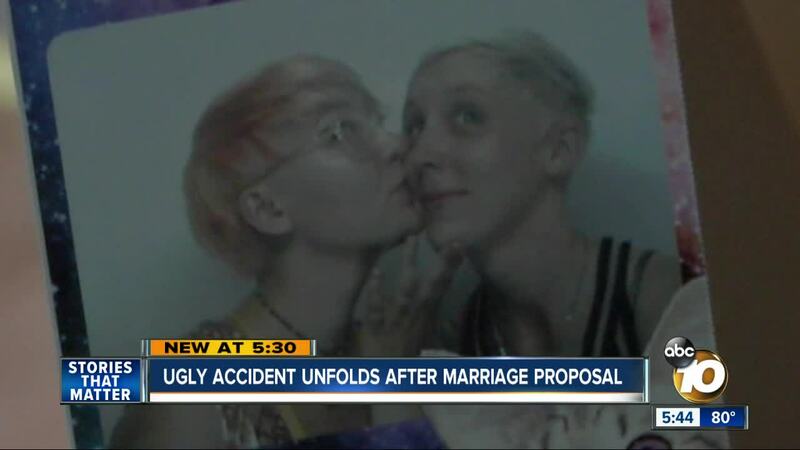 SAN DIEGO (KGTV) - A just-released police report is shedding light on an ugly accident that unfolded hours after a magical marriage proposal. Elan Conlin proposed to her girlfriend Charli a month ago over dinner at a restaurant in Little Italy. "I casually pulled the ring out of my bra and she was confused, and I proposed ... It was an amazing night," said Conlin. The answer was yes. The next afternoon, they decided to celebrate some more with a trip for sushi on a rainless day. Charli and a friend were on a motorcycle. Conlin was right behind on her Vespa scooter going about 25 miles per hour. As they slowed down near a stoplight on Convoy Street, Charli's bike skidded slightly. "I noticed it was wet, and I saw there was loose gravel," said Conlin. "My wheels start wobbling, and I get off balance ... and the bike falls on me," said Conlin. The crash broke her leg in several places, and dislocated her knee. "My best friend said my screams took 10 years off of her life," said Conlin. Conlin says among the first to help her were five construction workers, who helped direct traffic. She's grateful to them, but also believes the wet and loose gravel - confirmed in a police report - was part of some road construction she didn't see coming. "The road wasn't blocked off and there was no "Road Work" sign," said Conlin. Doctors say she won't be walking for the next six months. Her October wedding date is delayed. "It's probably going to be next October. I don't want to roll down the aisle. I want to walk down. I want to be able to dance," said Conlin. 10news reached out to a city spokesperson, who says there was no planned road projects during that time period. Conlin, now unable to work as a barista, is mulling legal action. A Gofundme campaign has been set up to help with Conlin's expenses.